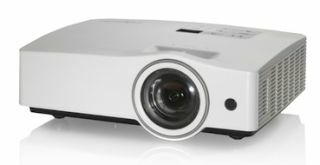 Optoma has introduced two new EcoBright solid state illumination (SSI) short-throw projectors, the 2500 lumen ZW212ST and its 2300 lumen cousin, the ZX212ST, both designed to help businesses and educators more effectively display their presentations, save money and reduce their carbon footprint. Offering a 100,000:1 contrast ratio that ensures crisp, clear, readable text, both the WXGA resolution ZW212ST ($1,599) and the XGA resolution ZX212ST ($1,499) employ all the latest command and control technologies, ensuring easy system integration and operation in any boardroom or classroom environment, the company says. Both Optoma EcoBright projectors offer wireless capabilities and Crestron certification for remote management and control. MS Office Viewer is preinstalled and supports direct-playback of movies, photos and Office files from the projectors’ 2GB internal memory, through the USB port, or via an SD card slot that supports up to 32GB of memory expansion. Both projectors also provide inputs to satisfy any infrastructure need, including HDMI, VGA-in, VGA-out, mini-USB for display, USB for wireless connectivity, RS-232 and RJ45 ports for remote management through a larger network, S-video, composite video, audio in and audio out, Optoma’s Z series projectors utilize the company’s SSI technology that incorporates both LEDs and lasers to deliver high-lumen output and vivid color reproduction over periods of extended use, while at the same time using less power and reducing the projector’s carbon footprint. Each new projector’s virtually-maintenance-free light source is rated to last more than 20,000 hours.